Aquatech needed funds to fulfill its growing export orders so it sought EXIM Bank's support. The company's use of EXIM's working capital guarantee has grown as EXIM supported $230 million in exports (2012 to 2017) as the green technology company expanded foreign sales of industrial water and wastewater treatment products and services. Its technology includes zero liquid discharge treatment, water reuse, and desalination. The company has added export credit insurance for nonpayment protection to cover its high export volume. "In today's challenging global economic environment, EXIM Bank support of our exports gives us opportunities that we otherwise would not have. The EXIM Bank facility allows us to serve buyers in many different countries, like Saudi Arabia, India and China, that are less hit by recession. 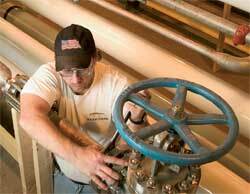 Exports make up 40 to 60 percent of our business, and these sales have helped us create and maintain jobs at Aquatech. EXIM Bank has had a positive impact on our continued growth,"